IPL’s Thursday match was very interesting for the Indian Premier League fans as the match has created another history. Yes, the Sunrisers Hyderabad (SRH) won the match by 9 wickets against Delhi Daredevils (DD). However, the star of the match was Rishab Pant who scored mindblowing runs i.e. 128 on 63 deliveries. However, DD will not go to participate in IPL playoff now after defeated by SRH on 10th May 2018. Therefore, it is a sad news for DD fans. 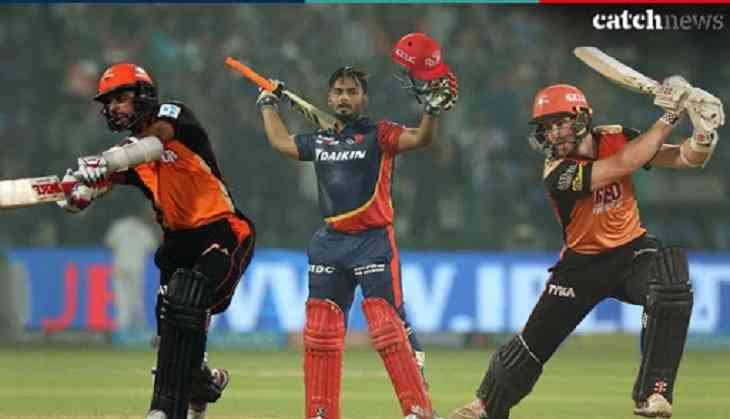 Rishabh Pant has hit his first century in IPL and his outbursting performance helps the team in giving the target of 188 runs to SRH. However, after losing the first wicket, SRH player Shikhar Dhawan and skipper Kane Williamson played an unbeaten partnership and of 102 runs in 102 balls. Both players performances easily achieved the target and win the match in the remaining 7 balls. Yesterday match played between SRH and DD, the 42nd match of IPL has given the huge record in the history of IPL. Because the three players of the match have scored runs more than 80. This is also the first time in the IPL that three players have hit more than 80 runs. The amazing thing about last IPL match was that all three players were unbeaten. 1. Rishabh Pant (DD)- 128* runs in 63 balls. Not only these 3 players who scored highest in IPL but these players are also in the list who played the best innings in the Indian Premier League and registered their name in records list. Well, we must say IPL has set the benchmarks among all the popular of Cricket leagues and given us the huge records in T-20 matches.